Au Ver a Soie comes to us from France, and these threads are some of the finest pure silk, spun silk, bourrette, and metallic threads available. The pure silk comes directly from spinning of cocoon silk fibers. That makes it the shiniest silk. The spun silk comes from the worsted silk spinning, and the bourrette is a by-product from the spinning. 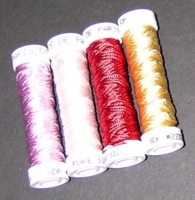 Au Ver a Soie thread is used for embroidery, sewing, lace, weaving, trimming, knitting, patchwork, carpet, tapestry, and jewelry. There are more than 1500 colors available. A filament silk, Soie de Paris is 6-ply, pure, and of the best quality of raw silk giving it an unrivalled brightness and softness. Soie Chenille à Broder (Silk Chenille for Embroidery) is like the finest velvet and actually feels plush to the touch. 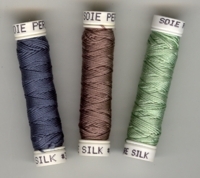 Au Ver à Soie Perlée® is a 3 ply twisted filament silk that is smooth and soft. It is available in 365 colors. If there's no COLOR SELECTION KEY for a particular thread you are trying to find, please call us at (860) 257-2718, or email us at thisneedle@aol.com with your request.